The 2018 legislative session has now officially arrived. 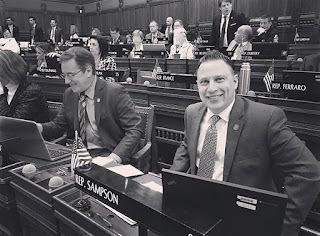 In many ways, it feels like I never left the Capitol since we have had numerous special sessions over the last few months to address Connecticut’s significant budget problems. Those who follow my efforts and this column are well informed of the problems we face and the frustrations I share about the lack of common sense and priorities being a part of the decision-making process in Hartford. This time of year, I am often asked what my priorities for this year will be. It’s a great question for me since my standard answer to what is wrong with our state government is always the same, and it is just that – a lack of priorities. My priorities have been the same since before being elected. First, I will always work to make our state more competitive so residents and businesses choose Connecticut as a place to call home. Making Connecticut more competitive with neighboring states means reducing the size and cost of state government. Doing so will shrink the tax and regulatory burden on companies and will encourage them to invest here. Most of what I do falls in this category because it is all encompassing. From trying to reduce the cost of healthcare and insurance, to pushing back on the terrible energy policy that has been adopted in recent years and continues to drive up electric and heating bills, to making it easier to run a competitive business with less government regulation, to protecting small towns from damaging state mandates and reductions in state aid that drive up property taxes, and countless other ways our state government makes it more expensive to live and work here, I am always working to improve our economy. Second, I will always protect our civil liberties, our constitutional freedoms, our American way of life, and the rule of law. Our culture and ideals are under assault today. I am proud to be the loudest voice in our legislature for defending the liberties guaranteed by our Bill of Rights. These include protecting law abiding citizens from unnecessary and ill-conceived attacks on the 2nd amendment, pushing back on the restrictions to free speech being imposed on political candidates, and standing up for the rule of law on illegal immigration. Third, I will always be a consistent and persistent voice for my district. I will always fight to make sure the people I represent have their voice heard at our state capitol. I try to answer every call and email I receive personally and do my best to make sure that my constituents know they have me in their corner whether it is an individual concern or something that affects us all like fighting against reductions in state aid to the towns in my district. I have never and never will vote to short-change the people I represent under any circumstances. These priorities are, and always will be, my agenda for this session and all others. The short session, which takes place during the second year of our term, is supposed to be primarily for adjusting biennial budgets passed during the previous year. However, if you have been following the news or heard Governor Malloy’s recent address, you know that is the last thing he and legislative Democrats want to talk about. It seems this year will be filled with lots of other issues designed to distract us from the real work that needs to be done. There is already plenty of talk about tolls, gun control, and restoring federal changes to Obamacare made by Republicans in Congress. Earlier this month, as Ranking Member of the Insurance Committee, I stood firm and led my Republican colleagues in opposition to a bill put forward to restore the so called individual mandate that existed in Obamacare. This is essentially a fine for failing to purchase health insurance. If this measure becomes law, it will not lower the cost or improve the quality or availability of healthcare and healthcare insurance. As I stated during the committee meeting, there are only two reasons why people choose not to have health insurance; either they cannot afford it, or they are making a conscious choice as free citizens to go without it. Either way, the state should not be fining them for exercising their basic rights as consumers. This is just one example of a dangerous agenda that continues to plague our state government and affects each and every one of us as citizens. It has been my greatest honor to serve our community and stand for the priorities I listed above. I promise to continue to do so as long as I am able. As always, my door is always open, and I encourage you to contact me at any time. Visit me at www.repsampson.com.